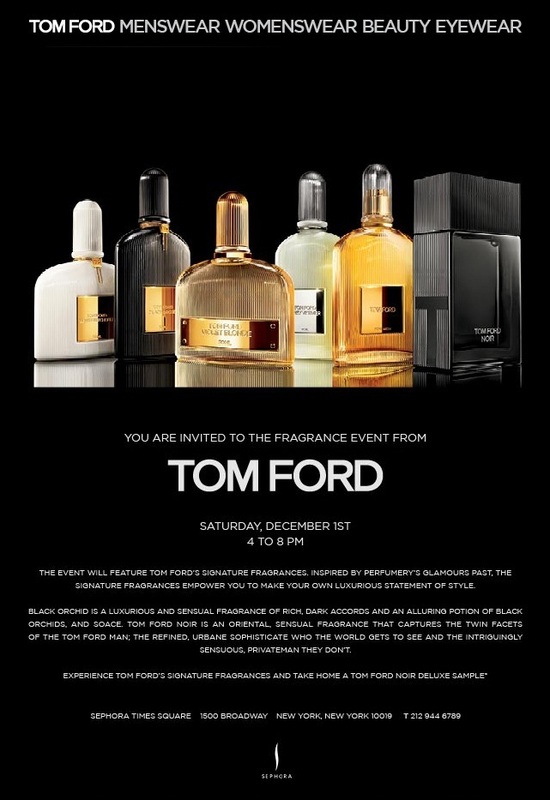 You are invited to Sephora Times Square for the fragrance event from TOM FORD on Saturday, December 1st from 4 to 8pm. The event will feature TOM FORD’s signature fragrances. Inspired by perfumery’s glamorous past, the signature fragrances empower you to make your own luxurious statement of style. Black Orchid is a luxurious and sensual fragrance of rich, dark accords and an alluring potion of of Black Orchids, and soace. TOM FORD NOIR is an oriental, sensual fragrance that captures the twin facets of the TOM FORD man: the refined, urbane sophisticate who the world gets to see and the intriguingly sensuous, private man they don’t. Experience TOM FORD’s signature fragrances and take home a deluxe sample of TOM FORD NOIR.